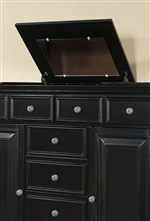 Transitional in style this panel bed is constructed from select veneers and hardwood solids that have been bathed in a beautiful rubbed black finish. 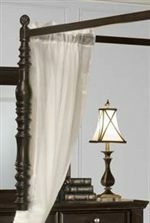 Raised panels on the headboard and footboard tie in traditional design elements while the distressed looking finish adds a whisper of island style. 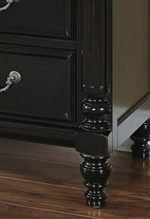 Fluted and turned details on the legs and post's complete the eye-catching design of this bed. The Martinique Bedroom Transitional California King Panel Bed by New Classic at Michael's Furniture Warehouse in the San Fernando & Los Angeles area. Product availability may vary. Contact us for the most current availability on this product. 00-222-210 Transitional California King Panel Headboard 1 80" 5" 60"
00-222-230 California King Panel Rails and Slats 1 2" 85" 5"
00-222-220 California King Panel Footboard 1 80" 5" 32"